The citizens of Yemen now face a new threat, as though life there was not already harsh enough. Over 300,000 Yemeni already suffer from cholera (40% of whom are under the age of 15,) and the estimates show that up to 500,000 could face immediate starvation as a result, or many more if conditions deteriorate further. Resources from food programs had to be shifted in order to provide the necessary vaccine doses to combat the problem and contain the spread of the disease. A record nearly one million doses was put aside for the people of Yemen, but, as has just been announced, critical shortcomings in infrastructure and security have put the project in jeopardy. The Saudi coalition, actively supported by the US and UK, has not only targeted and bombed a large number of hospitals, but has closed off nearly all of Yemen’s seaports and airports making delivery of critical medicine and food practically impossible. Power shortages have crippled water treatment plants and hospitals which only exacerbates the problem. Lack of refrigeration also puts certain medicines out of reach. Problems with the central bank have prevented healthcare workers from being paid, and they now depend upon humanitarian organizations for help, as well. The initial shipment of 500,000 vaccine doses which is already in Djibouti would probably be re-routed to Africa instead of going to the war-torn country, according to WHO spokesperson Christian Lindmeier. The vaccine is an oral form and is intended as a preventative measure as it would do no good once the disease strikes. The vaccine only immunizes about 65% of those who take it as well, so the problem is likely to keep growing before it is eventually controlled. “The speed of the spread of the disease is unprecedented,” Doctor Nevio Zagaria, the World Health Organization’s representative in Yemen said. The situation is further complicated because deciding who gets the limited supply of essentials is likely to cause tensions between the warring parties. The UN sought $2.1 billion to provide food to the millions people facing famine in Yemen but has received only a third of that amount. Up to eight million people are at risk of starvation. An appeal for $250 million in funding for cholera relief has only raised $47 million. Compared to the hundreds of billions which Saudi-Arabia has spent on weapons (from the US, the UK, Canada, and others,) it seems like a drop in the bucket. Saud has, ironically, pledged $3 billion to alleviate hunger in Yemen, but nobody expects much of it to go to the people of Yemen. The money will probably be spent on rebuilding infrastructure after the conclusion of hostilities and will certainly be given to British and American companies, instead. The people know this somehow, and it leads to the mistrust which only amplifies the problem of disease. Many people in need of aid would simply refuse it claiming that the western powers who were there to help actually wanted to kill them all and their children, so they routinely refuse vaccines and medical attention. Trust, or lack of it, has become an issue which further increases the misery of those so affected. There is a great mistrust of the schizophrenic west who bomb them by day and seek to offer their help by night. Using illegal munitions like cluster-bombs and white phosphorus (as against the Palestinians) does not help the situation either. The question raised is that with millions of Yemeni susceptible to cholera, will one million doses actually be enough? Originally, 3.4 million doses were requested, but due to simultaneous outbreaks in other countries such as Somalia, Malawi, Mozambique, and South Sudan, the stresses placed on supply, production, and transport infrastructure are overwhelming. Continued war, of course, leads to all these miseries and is the greatest continuous threat, and with continued weapons sales to the middle-east, the end of their suffering is nowhere in sight. Let’s not forget that when there is no food, the only way for some of the older children to avoid starvation is to join the rebel forces. This is portrayed in the media as a recruitment of child-soldiers. The oppressed rebels are always to blame when dealing with regimes and empire. Adding to all these horrible facts and adding to the prolonged misery of the people caught as prisoners in the war zone is that journalists have been barred from entering the country. This also serves a purpose, though; it means that all the atrocities committed against Yemeni civilians by western powers will go unnoticed. There will be nobody to report on the illegal weapons and munitions, nobody to recruit outside sympathy and financial assistance to those suffering, nobody to speak for the voiceless masses, and nobody to tell the story of an atrocious situation in horrific conditions under the oppressive impulse of invading forces. So why does the west support this war? Why are we selling our weapons to these forces? Why are we involved in this ‘legitimate’ civil war (unlike the mercenary war in Syria,) if such a term can be used? Why are we involved, once again, in regime change halfway across the world? Why have we formed this coalition of the usual suspects? In a word: Iran. Iran (read: Hezbollah) backs the Huthi rebels. It is simply another proxy war, another reason to vilify our enemies, and once again, the people paying for it, living in misery, suffering through disease, starvation, death, and destruction, are innocent and helpless civilians. Help shine a light any way you can. Use social media to do the job that the press either will not or cannot do, lobby your governments, donate to relief funds, crowdfund the purchase of BAE or Raytheon, do whatever it takes, do whatever you can. Us little guys should stick together against the forces of tyranny; we are their only defense and their very last hope. Is It Teats-up For The American Empire? Eurasia may be a new term all Americans will be forced to learn. The Euro’s collapse may well be due to Turkey’s geo-political shift. China’s debt crisis is no big deal, they’ll just liquidate their US holdings. Turkey is turning its back on the west which will have disastrous consequences for the US dollar and all of the EU’s central banks. The quadrillion dollar derivatives market is about to become the world’s biggest eraser, rubbing out the US and EU economy in one blow. Turkey controls all the ME oil flowing into Europe and most of the water flowing into the ME. “We continue our joint work on building the new gas pipeline Turkish Stream.” This pipeline is the first step in making the Ukraine obsolete as far as supplying Europe with Russian gas. Russia hits another home-run while NATO tucks its tail between its legs. More and more countries are saying NO to NATO, Finland being the latest. 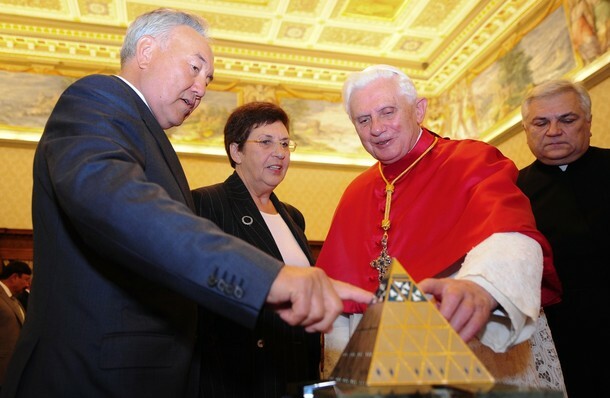 Nazarbayev has openly called for an end to American hegemony through the reserve currency, wants the UN headquarters to be in Astana, and, oh yes, controls all the world’s LEU uranium, thanks in large part to Warren Buffet. With Syria going Russia’s way, Turkey knows it better start playing nice with Asia. Russia controls over half of Turkey’s gas imports, and a third of its coal. It is also working out a deal to supply Turkey with the S-400 missile defense platform. The days of the petro-dollar are coming to an end. Still, the US presses on with its belligerence, surrounding Russia with nuclear weapons, launching sanctions, gossiping all day on CNN, all with the goal of pushing Russia to launch a first-strike so it can retaliate and say, “You see… Russian aggression.” This is just silly because if Russia does launch a first strike, it won’t be with nukes, it will be to take out all American satellites, thus rendering all US missiles and defense systems useless. America cannot get astronauts to the ISS, nor can it get new satellites into space without Russian rockets. Russia controls space, therefore, it controls the battle-space. Is this an exercise in futility? You bet it is. It’s over, and Nero is tuning his fiddle. Now you may ask yourselves why I quoted TASS, the Kremlin, Xinhua, and voltairenet.org & strategic-culture.org instead of mainstream western sources? It is for the simple fact that none of them have reported any of this. With all the hoopla surrounding COP 21 in Paris, you’d think there would be some media coverage of COP 22 in Marrakech. Not a word. That always makes me nervous. Huge deals signed in the dark always will. I’ve always wondered how the cities get picked for these events. Today, Julian Assange let slip that King Mohammed VI of Morocco has given the Clinton Global Initiative twelve million dollars (24:52). On the other hand, that means nothing. Maybe there is a better reason to hold it there. There is a lot of dissent in Morocco, at the moment, and might prove to be a good staging area against populism in Africa. That’s a legitimate reason. You see, not everything has to be a conspiracy. Then again, there could be more to it than that… there always is. “In an exclusive interview, Dr Bates accused the lead author of the paper, Thomas Karl, who was until last year director of the NOAA section that produces climate data – the National Centers for Environmental Information (NCEI) – of ‘insisting on decisions and scientific choices that maximised warming and minimised documentation… in an effort to discredit the notion of a global warming pause, rushed so that he could time publication to influence national and international deliberations on climate policy’. MUST WATCH: American peace delegation goes to Syria, sees opposite of what MSM reports. No civil war in Syria; Syria united under Assad. Here is Vanessa Beeley’s blog. Here is Eva Bartlett’s blog. And see here for some back-up from Global Research. …pocket change that is, is changing. One dollar coins (Loonies) were popular as a forgotten novelty; two-dollar coins (Toonies) were not. I remember working in the service industry back in those days. Everyone complained about the amount of change they would have to carry around in those money belts. The money belts grew more robust. Waiters today are in for a surprise. This move, on it’s own, will likely lighten waiters’ loads (and necessitate another re-design of the money belt,) but there’s more. The five dollar bill will be replaced by a coin. $5 bills represent just under 2% of the Canadian money supply. [It won’t be long now for the tens.] A two-hundred dollar bill will also be introduced. And all this for 2017. What ever happened to banning the ‘C’-note? In the cancellation of a bill, is a demand for it not being created? As they cancel more and more bills, and create new ones, won’t they be feeding the monster they wish to slay? Getting people to hoard cash is not good for banks. The Bank of Canada eliminated the thousand-dollar bill in 2000 for this purpose, and put the blame squarely on drug-runners and money-launderers. Movement of physical cash is closely watched at the borders and at all points of entry. Are they developing cover for a digital monetary system? Are they really going to ban cash? These recent actions lead us to believe that they will not, but sometimes an event must be manufactured with nothing but ‘good intent’ behind it acting as a catalyst to ensure it’s quick demise. Kissinger might find it easier to pop the balloon rather than let it deflate on its own. That would require intervention. Intervention always incurs cost. Portugal had to wreck its economy for the former Prime Minister (1995-2002) António Manuel de Oliveira Guterres (a notable socialist, ECFR, and Club of Madrid member – not to mention his long list of distinctions) to be elected Secretary General of the UN. That’s quite a cover charge for entry to the big boys’ club. I wonder if it was on a dare or a bet, or if it was just an initiation, of sorts. With that against him, his loyalty would be assured. Amongst other positions, he had previously served as the UN’s High Commissioner for Refugees. Is Canada next? The Asian money doesn’t seem to think so, but the Canadian government’s recent action in the Vancouver housing market was a clear signal for Asian markets to ‘keep away.’ The manipulation practiced by Wells-Fargo, Shkreli, Volkswagen, and the gold market pale by comparison. Where’s RICO when you need him? It looks like the Lone Ranger is gonna’ need some more silver bullets, and gold ones; or maybe Dorothy could just click her heels… rubies and sapphires might have some value, but emeralds are not a good investment. As with all military forces, where there is a significant advantage, be it technological, logistical, geographical, financial, etc., wars of aggression are always waged by the more powerful. Mice do not roar. Knowing that international power ebbs and flows, and that the militarized police act as the glue, they take it while they can. Holding it proves harder. Holding and expanding is the ultimate goal. Hundreds, no thousands, from Alexander, Caesers, Attila, Napoleon, Rothschild, Hitler, have all wanted to rule the world. Who’s to say nobody wants to do that anymore. TPTB have always wanted a slave population to do their bidding. They have always been at war with the lower class. They have wealth, and we have numbers. They get richer, develop better weapons, live longer, and we just multiply. They’ve never been richer, but they’ve neither ever been so outnumbered. All international treaties, the UN, world governments, Ngo’s, trade deals, environmental legislation, the legal system, industry, the military, etc. are structured to keep us occupied (productive) and distracted, and to die older. Don’t rock the boat and you get to have toys; start thinking for yourself and it’s time for re-education. The more docile the population and the more loyal the soldiers (by love or by fear) the better the odds they will be triumphant in an aggressive war. The US spends more money on ‘defense’ than any other country in the world. It is assumed they have the best military. They also spend more on health care than anyone else. They do not, however, have the best health care. But they THINK they do. So what if, while trying to hold on to hegemony, they do attack Russia overtly thinking they have the advantage? What if Russia calls their bluff? What if Russia isn’t so backwards? They keep hacking the US, after all. If Russia and China can hack the US, all their drones belong to ‘them’. Size doesn’t matter if you can just pull the plug. And it ain’t just the military; it could be demographics, it could be the banking sector, debt, cyber, stocks, disease, natural disaster… any one of these things could beat them before they get out of the gate. And what if THEY see an advantage? The problem here is that US military superiority is only perceived to be so, the reality is, though greatly speculated on, unknown. What if they perceive an advantage where there is none? We’re still the ones doing their bidding, but there might be a lot less of us after something like that. That’s how much they hate us… they’re willing to go live underground for a generation if it will just rid them of us. Like when you have to move out of your house when you fumigate, well it’s something like that. Can We Both Be Right? I had an exchange with a climate alarmist the other day, an exchange for which I felt the need to apologize. I sent him an email today. The subject line read: “Apology”. Yesterday, we had exchanged opinions and facts about climate change and couldn’t agree about any of it. Today, the day after our exchange, I found myself bothered by it. I wondered why we couldn’t get along? He is a damn good researcher; how could he be so wrong. Maybe he thought the same of me. I was going through an article I had recently written, looking at a graph which showed temperature and CO2 levels over the past several hundred million years. I saw that both CO2 levels and global temperatures had very rarely ever been this low, and I thought that surely this would lead to desertification. After all, the tundra is a desert, despite its low temperature. How could he think that this natural uptrend after near-record cold was anything but normal, anything to be worried about, anything unexpected? It had since leveled-off, so no problem, right? Why did he look at it as record highs when it was clearly (near) record lows? My short answer was that he must only have been looking at the local US surface temperature record over a very short time span, and I was looking at satellite data as well as long term data covering more of the history of the earth, and this is what led to his distorted view. If the charts start in the sixties, it’s been getting warmer. If the charts start six-hundred million years ago, brrr. On a planetary level, however, no big deal. This seemed to explain away the problem as well as all the sub-problems like sea-level rise, Arctic ice extent, storm activity, etc. etc. etc. He was the American alarmist who took the ‘nothing outside our borders matters’ and the ‘we have the best equipment so everyone else is wrong’ view, and I was the voice of reason with a view to the world. Typical US-Canada relations. I went for a walk to clear my head. Why was this still bothering me? I had figured out the problem; I had my answer. But there was more to it than that. There was something missing. As I walked around my neighbourhood, I thought about power structures and relationships, I thought about hegemony and what it can do to one’s perspective, I thought about the philosophy behind the situation when it hit me: Hegel – Mondrian – binary code. What if we were both right? Climate Change – Conservancy Or Governance? 1- Who are the chief actors? Con AGW actors will herein be known as ‘doubters.’ ‘Deniers’ is seen as derogatory and has been replaced in the mainstream media (MSM.) Skeptics is still prefered by some. 2- Is the global climate changing? Yes. It always has and it will continue to do so. This is why there have been ice ages. 3- Is this change due to human activity? No. (see question 4, below) The sun is the primary determinant of climate as this is where the planet gets almost all its energy. 4- Does human activity contribute to warming or cooling trends? Otherwise stated, is anthropogenic global warming or anthropogenic climate change (AGW or AGCC) a legitimate concept? On the face of it, probably not, but if it is, the effect is truly minimal. The rub here is whether or not we consider geo-engineering (besides a slight mention, geo-engineering is not a substantial part of this article) as part of this equation? If so, the effect would be to increase the amount of influence man has on his environment, although very slightly. In which direction, though, is still not known. 5- Is CO2 pollution or plant food? CO2 is most definitely not pollution by any definition of the word. Conflation between carbon monoxide (CO – which is pollution) and carbon dioxide (CO2 – which is plant food) and basic scientific ignorance seem to be at fault here. See this article for disambiguation. 6- Does the economy have an effect on the science? Just as with politics, when money is introduced into a problem, it tends to aggravate the situation by bringing up new problems. The economy affects everything. Governments need revenue to fund research and address issues. Corporations need investors in order to continue doing business. Universities and think-tanks need government (and private) money to continue their research. Magazines, journals, and publishing houses need advertising revenue to continue to publish. Scientists need money to support their families. There are many points along this chain in which to introduce money as a corruptive factor. Money can indeed influence science, and has. 7- Does politics control policy, or do the facts? It would seem that there is an agenda at work behind the question. The IPCC (the UN’s main deliberative body on climate change) was, at its inception, created with a mandate. The IPCC is a political body and not a scientific one and was created with specific goals and objectives to attain. Their own literature attests to this fact. Scientists who participate with the IPCC do so as consultants and advisors only. Motions put forth by the UN are written by lawyers, bureaucrats, translators, and policy-makers, not scientists. 8- Is there bias in the debate? Both sides of this question are subject to biases (scroll down to the comments section where professor Brown references these biases) when reporting on the data. Everybody who works in this field has a horse in the race, so to speak, and everybody wants their horse to come out ahead. However, there are several documented instances of outright fraud concerning manipulated data which all seem to come from one side of the table in particular – the alarmist side. (More on this later) And yes, many people on the internet lie or are mis-informed, on both sides. 9- How much carbon dioxide is there in our atmosphere? 400 ppm = 0.04% That is to say that four one-hundredths of one percent of our atmosphere is composed of carbon dioxide. Start at the 20:00 mark if you don’t have much time. In this video, Lord Christopher Monckton lays bare the language of the agreements reached at several climate summits demonstrating the true intent behind these schemes. He then goes on to suggest some very positive actions which we all can take in order to guarantee legitimacy and transparency in these international tribunals governed by non-elected bodies accountable only to their own interests. With the COP-21 United Nations Conference on Climate Change in Paris quickly upon us (November 30 to December 11, 2015) there is precious little time to act. Let’s put an end to global warming. Kazakhstan is an interesting place with a broad and diverse history. From Genghis Khan’s invasion to Stalin’s deportation of undesirables from the west of the country (which contributed to the region’s ethnic diversity) as inmates of the gulags to the unilateral dismantling of their nuclear program in the post-Soviet era, Kazakhstan has been down a long road to its present form of democracy/dictatorship. The image above is of the The Palace of Peace and Reconciliation, a.k.a. Pyramid of Peace and Accord. Among its many features are stained glass panels at the top showing three doves in the middle triangle, two doves on the right, and two doves on the left. This motif is echoed below by lozenges, again three in the middle, two on the right and two on the left. 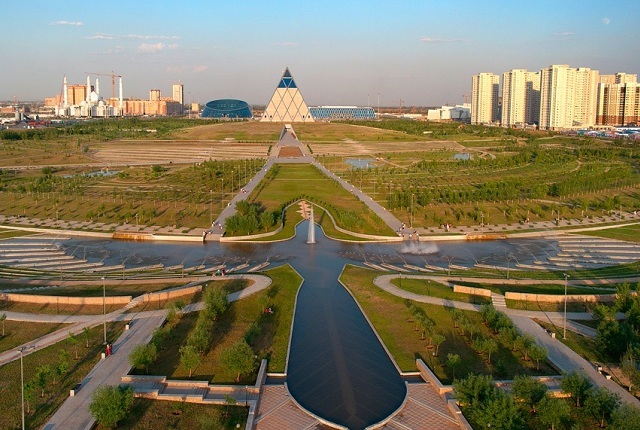 Kazakhstan has, of late, been on a building spree which would put pre-crisis Spain to shame. Financed by Kazakh supplies of oil, gold, and uranium (the world’s second largest producer and America’s largest supplier) as well as massive amounts of foreign investment (from the likes of Warren Buffet, no less,) universities, infrastructure projects, religious institutions, and sky-scrapers have all been popping up at a phenomenal rate. But there’s more. They have been building trade deals and international relationships, as well. Strangely enough, there are some other ‘improvements’ of note, which may seem, at first glance, contrary to the Kazakh stance on WMD. The USA is funding a bio-weapons research lab with the goal of fighting global terror. The lab will also serve as a storage facility for some of the most harmful and virulent strains of disease known (such as bubonic plague, yellow fever, anthrax, cholera, smallpox et al..) The BSL-2/3 (the highest level is BSL-4) lab will not only protect the diseases studied within from being stolen, but also protect the bio-chemists and engineers (and the knowledge they possess) from being hired by shady groups. There has been much unemployment in this field since the collapse of the Soviet Union, after all. *Update* The CDC reports unususally high rates of bubonic plague (black death) in the US. But more on this later. *Update – some evidence of this plan coming to light: America has attacked a power plant and a water treatment facility in Aleppo, Syria with no military value against ISIS. This could lead to an outbreak of cholera. “Russia currently pays Kazakhstan $115 million annually to use Baikonur Cosmodrome, plus $50 million every year for maintenance, under a deal signed in 2004. That agreement is slated to expire in 2050.” This is a pretty good deal considering the following, “NASA Administrator Charles Bolden sent a letter to Congress Wednesday saying the agency would need to pay $490 million to Russia for six seats on Soyuz rockets for U.S. astronauts to fly through 2017. That comes to nearly $82 million a seat, up from $71 million a seat. Since the retirement of the space shuttle in 2011, NASA has relied on Russian federal space agency Roscosmos to provide seats on its Soyuz spacecraft to send U.S. astronauts to the space station.” Further, “At the moment, Russia is the only nation capable of launching astronauts to the International Space Station. Russia’s crew-carrying Soyuz spacecraft all launch from Baikonur…” In addition, the US buys its rocket engines used for satellite launches from Russia and will need to do so for years to come. The American space program seems to be completely dependant on both Russia and Kazakhstan. What would happen if they decided to cut the Americans off? That the International Monetary Fund (IMF) should be removed from USA control and folded into the UN. Granted, these recommendations were to take place over a rather long period of time, nevertheless, it demonstrates either a cunning international play against the hand feeding it, or a willingness to accede to a plan already long in the making. He did sign on to help in America’s ‘War on Terror’, after all. Putin also said, during an interview with Charlie Rose, that there could be room for change at the UN, and the French and Mexican delegations pushed for a reform of the veto rules at the Security Council’s meetings, as well. It would seem that the winds of change are blowing squarely into American faces. Now Putin is turning his nose up at the Saudis after a meeting in Russia. And what was Ingushetia’s Yunus-Bek Yevkurov doing there with the others’ Defense Ministers? The first and current President of Kazakhstan is Nursultan Nazarbayev. In his speech to the UN today, he made several recommendations to the council. They were monumental in scope, especially considering the limited international status of his 25 year old country. Then again, based on what Putin said about the UN (or rather, didn’t say,) perhaps there are things in the works about which we don’t yet know. Kazakhstan is the largest landlocked country in Asia and has the strongest economy in central Asia. They have enormous oil reserves and are a leading exporter of uranium (ironic as that is.) It is also a world leader in coal, iron, and gold production. Their elections have been largely considered to be unfair and anything but free in the eyes of international observers. Kazakhstan is vying for a non-permanent seat on the UN Security Council in 2017. They enjoy good diplomatic relations with both Russia and the Ukraine. That there be one global currency to replace the favoured status of a reserve currency and the unfair advantages it confers upon the country that controls it. That the IAEA Low Enriched Uranium (LEU) Bank in Oskemen, Kazakhstan (agreement signed this August,) which removes the need for individual countries to enrich their own uranium by centralizing the distribution thereof, be the only source for enriched uranium. A kind of central bank for fissile material. This bank would be overseen by, and indeed, folded into the UN and included in its mandate. That nuclear weapons be banned, outright. That the UN headquarters be moved out of the US and into Asia. Given that France and Mexico et al. have proposed that the veto right of the permanent members of the UN Security Council be severely limited, It doesn’t look like the world is going to leave a lot of meat on the bone for the US to cushion its fall from grace. Could this be the impetus for WWIII which the UN was formed to avoid? There is a short follow-up article here.